I got a useful suggestion at the talkchess forum for filtering the ELO rating of players. Rather than allowing individual ranges for white and black, I decided to provide a single range that applies to both the white and black player. In the example below, only games where both players have an ELO rating in the range "1200-1700" will be shown. Leaving the lower or upper field empty effectively makes that field unbounded (for "1200-" means all ELO rating 1200 and above, while "-1700" means all ELO ratings 1700 and below). 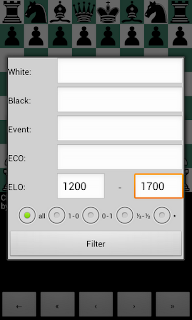 I have extended the game storage features of Chess for Android with the ability to filter PGN games, which is a useful feature when dealing with larger files. 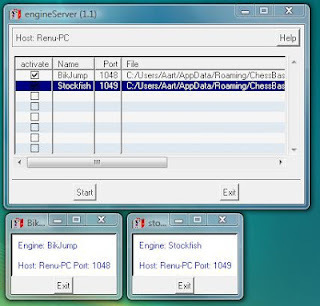 To use this feature, long press the notation window and select Game Storage. From there, you see the usual game storage choices, now extended with Filter Game from SD. After a file has selected, a filter window pops up. Here, you can define a filter involving the white and/or back player, the event, an ECO code, and/or the result of the game. After the file has been loaded, a window prompts all games that match the filter. 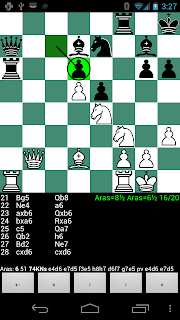 The user can subsequently decide what game should be loaded into Chess for Android. The new feature should be released very soon! Jon Dart released version 14.0.1 of Arasan and Jim Ablett kindly provided a binary for ARM-based Android devices. I did a 1 second per move match from both sides of the Nunn opening suite between version 13.4 and the new 14.0.1 using Chess for Android, which ended in 11-9 in favor of the older version (of course not enough games to say anything conclusive; the match was merely a quick sanity check on the new version).